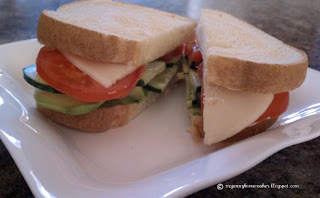 Recipe - Avocado and Cucumber Sandwich | Jenny. Maker. I interrupt this what-seems-to-be-a sewing blog to bring you a quick little recipe. With the warmer months approaching here in the US, it's time to try a new cool, fresh sandwich. Walter also claims it increases clarity of thought! Who knows if that's true but, if it is, maybe it can boost our sewing productivity too?? Spread mayo (or your preferred condiment) on one side of bread. Layer cheese, tomato, cucumber, avocado, and second slice of bread. (In case you don't know how to construct a sandwich ;-) ) Cut (or don't) and enjoy! That actually sounds like a yummy sandwich. I often make a similar one, but usually add some thinly sliced grilled chicken breast for a bit of protien. Bean sprouts are also a good addition. I think I will try this when I don't have any suitable protein - 'cause that's usually when I opt for a PB&J. Grilled chicken or bean sprouts sound like great additions to mix it up! I'm going to have to try that. You're not alone in opting for a pb&j but, I'm trying to find fresher alternatives.